My book in the Top 10! Just a quick note – I just found out that my book, “Life Not Typical: How Special Needs Parenting Changed My Faith and My Song” was named in the Top 10 Books on Sensory Processing Disorder by Special Needs Book Review. You can see the list here – we’re always praying that the book will help so many families dealing with difficulties and with special needs! I heard on Monday that Kyli, the girl whose family was my original inspiration for the song “Your Child” was ill and in the hospital’s PICU (Pediatric Intensive Care Unit). Kyli is 11, and severely impaired in many ways. 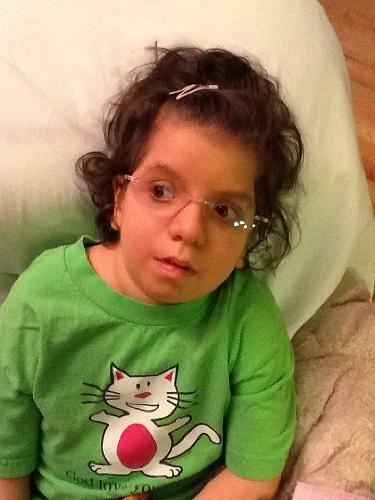 She uses a wheelchair and a feeding tube and doesn’t talk, and she is often in a lot of pain. But she is also absolutely sweet, and her parents are so devoted and loving. I met them a few years ago in New York at a concert, and I was so deeply touched and moved by their devotion to their child that I wrote the song. Later we made it into a music video and have been astonished to see that take off and be used by so many organizations. It’s been on Focus on the Family, Joni and Friends, Autism Speaks, Insight for Living, and many others. It’s been incredible to hear from families how much the song has meant to them. This past summer I had the wonderful opportunity to go back to New York and sing again at Kyli’s family’s church. Kyli was too ill to come that day and stayed home with her dad, Andy, but I was able to spend some time with her mom, Jodi, after the service, and I was also able to share how God had used the video and their devotion to inspire and encourage so many other families. Sometimes when you are serving faithfully and quietly at home, you have no idea how God can multiply that. It was so good to thank her. Back to this week. I heard Kyli was in the PICU and sent her mom a message telling her we were praying. Kyli had gotten a cold, and her breathing was impaired. She had been put on a vent and then taken off twice. They’d had to do it a third time and every time she got weaker. They tried to extubate her one more time and it seemed to be going well for the first afternoon, but then it became clear that she was working too hard to breathe on her own. Sweet Kyli went home to be with the Lord this morning. My heart is just broken for the family. I know their life has been very hard, but they wouldn’t have traded a moment with Kyli – she was such a blessing to them. Their faith has been incredible throughout, as has their church family. It has been something to behold, and the best picture of what it really means to be the family of God. Thank you for your witness, Jodi and Andy. And thank you for what you gave to this earth, Kyli. We will miss you. Last night was a pretty incredible evening. 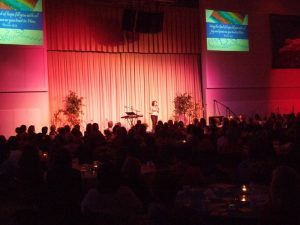 I got to do the annual Women’s Oasis event at Upper Arlington Lutheran Church here in Columbus (Mill Run Campus). I’ve had a long history with this church personally, and really, there’s even been a history with my family. This was one of the first churches to support my dad when my parents moved here to Columbus to start Young Life. I’ve done a guest worship stint here, and also a benefit concert for Young Life. I’ve also worked with another songwriter who goes here and does projects for them, so there are all kinds of connections. This is an outreach event they do every year, and this years theme was “Hope When Life Unravels.” They had a beautiful banquet and then I had about an hour to speak and sing. What a privilege to get to share the Gospel! And what a precious team they had working on it as well! Those women worked incredibly hard and it showed – the evening went so smoothly. Thanks for having me! Can’t wait to do something with you all again.